Vincent Thomas Lombardi Transformed Green Bay into winner in two seasons. He is considered by many to be the greatest football coach of all time. Lombardi had gave the Green Bay Packers a 89-29-4 record, five NFL titles, first two Super Bowl crowns in nine years. . . Led 1969 Redskins to first winning record in 14 years. He passed away at the age of 57 in 1970. He was posthumously elected to the Pro Football HOF in 1971. 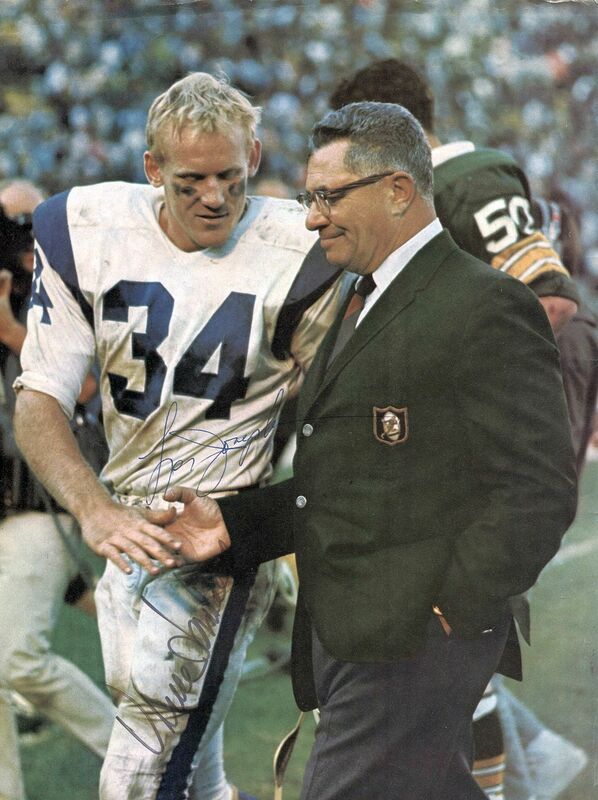 Les Josephson was a Pro Bowl runningback in the NFL from 1964 – 1974, primarily for the L.A. Rams. He was selected to the Pro Bowl in 1967. Offered is a signed approximately 8.5 x 11.5 signed Sport Magazine photo circa 1967. Signed in felt tipped pen by Lombardi and ballpoint by Josephson. Derived originally out of an in-person collection.